If you have an abundance of trees on your property, you may want to consider removing some or all of them. Perhaps you’re planning an addition for your home, or maybe you want to clear the way for a new swimming pool. If you’re a business owner, you may want to clear large expanses of land for a new shopping center. 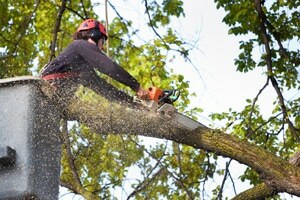 Whatever the case, count on on My Backyard Landscape Enhancements as the tree removal service Peoria IL relies on. As Certified Tree Workers and Certified Arborists, you can hire us with confidence for your tree removal project. We are also proud members of Illinois Green Industry Association, TCIA and the BBB. 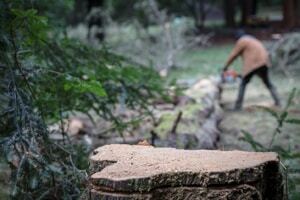 Our premier tree service focuses on safety, quality, knowledge and dependability. Trees are our passion. Thus, we are committed to their health, your home’s safety and the latest approved tree care practices. Too many times, we have seen harmful pruning, fertilization and mulching practices that can be detrimental or deadly to a tree. Unhealthy (are branches at the top of the tree dying back or does the trunk show decay?). Growing too close to your house, utility lines or other structures. Same goes for the roots. Leaning too close to your house, driveway, deck or kids’ play areas. Dropping a large amount of leaves or needles, sap, seeds and branches. Obstructing your view or creating too much shade for your lawn to properly grow. Too large for its location. In the way of construction or could be damaged by heavy equipment. Infested with disease or insects. Crowding other trees on your property. To learn more about our tree removal service in Peoria IL, please contact us at 309-657-0571. We serve all of Peoria, East Peoria, Peoria Heights, Chillicothe, Dunlap and surrounding areas.